The Trophèe d’Armes atop Fort Jay’s sally port on Governors Island was sculpted in 1795 from red sandstone, and first photographed in 1864, the year before President Lincoln’s assassination. 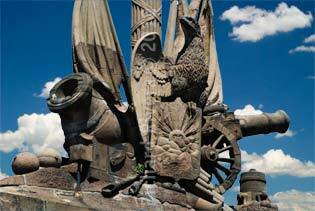 It is one of the earliest pieces of sculptural Americana using the eagle as a centerpiece of a three-dimensional coat of arms. Heraldry is sometimes described as the “shorthand of history” and the Trophèe d’Armes does that by placing all of the elements of a historical conflict (the British attack of July 1776) within a self-contained symbolic object. By the 1790’s, when the Trophèe d’Armes was carved, the symbols of defense used in the battle against the British were well established and already depicted on the shoulder plaques worn by New York State artillerymen. The symbols used in the Trophèe d’Armes are (from left to right) mortar and bombs, small cannon and round shot. The eagle with flags holding a shield showing the rising sun, the symbol of New York State; behind it a group of bound sticks, typically shown in Roman Empire symbolism as the fasces (bound sticks with and axe protruding from the side, indicating power and jurisdiction); and topped by a Liberty Cap worn by the Sons of Liberty during the American Revolution. The sculpture might have been designed to rest against a wall because it was not designed in-the-round; it’s back is flat and indeed some elements are just cut off. Since it was created in 1795 the The Trophèe d’Armes has been heavily damaged by unknown causes. The photograph from 1864 shows both wings missing as well part of the flags. Much has since been restored, and restoration of the entire sculpture continues to this day. The World War II Memorial, known to many New Yorkers as the Battery Park Eagle, commemorates the United States servicemen who died in coastal waters of the Atlantic ocean. It was dedicated in 1963 by President John F. Kennedy shortly before his assassination. 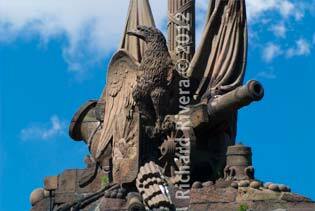 The bronze eagle is approximately 11 feet tall, and sits atop a six-foot high pedestal of polished black granite. 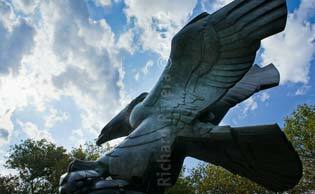 It appears to be swooping down but carries olive branches in its talons, the symbol of peace and victory. It was created by sculptor Albino Manca.